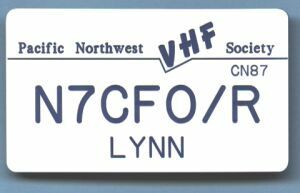 Order the official PNWVHFS name badge for $15 along with your conference registration! Place your order by Oct 1, 2019, and pick it up during conference check-in. See the 2019 conference registration web page. Fill in your name as you'd like it to appear on the badge. Choose your desired fastener type. Already registered? Want to add a badge? Fill out the conference form using only the badge-order portion. Want a name badge? But not coming to the conference? Fill out the conference form, but only pay for the badge. We'll mail your badge to you. 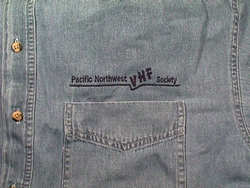 Send your completed form and payment to the PNW VHF Society address. Your badge will be waiting for you at the conference check-in desk. The official PNWVHFS name badges are produced by Capital Engraving in Longview, WA. You can always buy these name badges at any time; the group purchase order is not required. As of August 2013, these are available by mail order for $10.75 with standard pin fastener. You can get the "military" or the "alligator" type fastener for an additional $.50, or a magnetic fastener for $2.50. The minimum shipping charge is $3.00 to a single address. Contact Stan at lsemb@rainierconnect.com for more information and pricing.